A small research library is available for visitors to use in researching history or to identify their clock or watch. Library is available for use during our regular hours of operation. No appointment is necessary. And don't forget our museum store for many books on horology (go to Shop page). To access the Archives for research purposes, please call 860-583-6070 or email info@clockmuseum.org to schedule an appointment with our curatorial staff. 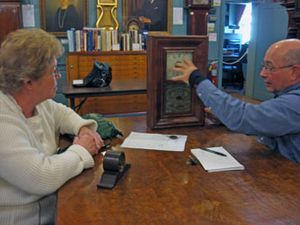 Clock Identification and Watch Identification Days are scheduled on a quarterly basis at the museum. 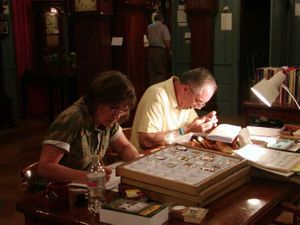 For $10/item (3 item limit), experts will be on hand to help you learn more about the history of your treasure. Consult the Calendar page or call the museum at 860-583-6070 to inquire about these special days. Research is conducted as a fee-based service by ACWM for $40. Requests are answered in 1-4 weeks depending on request volume and research needed. Click here to get the PDF form and mail it with pictures of your item to ACWM. For more info or if you are unable to open pdf files call: 860-583-6070. If you would like to request permission to study our collection, take photographs, or to film in our museum, please make an appointment by calling 860-583-6070 or emailing the Curatorial Department. Onsite research is by appointment only.